Peruvian Gino is an exceptional white male with lineage to match. His sire is Peruvian Dakotia, who produced champions in every color. His grandsire is Peruvian Bueno. 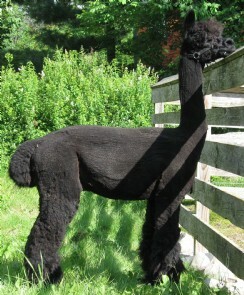 My Peruvian Gino is straight from Magical Farms Herdsire Row, where he won 2nd fleece in the 2004 AOBA Nationals. His density and fleece character are top of the line. Gino carries one of the most dense fleeces out there, and this density combined with incredible consistency and softness makes him a favorite with the judges. But Gino is also the perfect stud male for those breeding for color. He produces 'accoyo white' from white dams, and evens up the color from color dams. So far, Gino has thrown pure white from white (3); vicuna from vicuna (1); medium brown from dark brown (2); white from beige (1); and bay black from black (1). This black male has unbelievable density, a bold crimp and a very heavy boned frame. He is the only black son of the the White Peruvian herdsire Gino. Priceless has a phenomenal style to him with coverage from head to toe. to add to his coverage, there is a nice bold crimp wherever he has fiber. His fleece is soft and dense with a great handle. We started breeding him last summer and anticipate some beautiful cria on the ground this year. Please contact us if you are interested in Priceless. 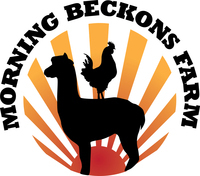 ** UPDATE - We had 2 cria from Priceless last year and they are spectacular. We sold both offspring before they were 18 months old. He may have started late but he is sure to produce some great cria this year and in the future.